May 23, 1913 –In another of a series of articles dealing with the “new slogan” for the city [Chicago Daily Tribune, May 23, 1913], “Where ‘We Will’ There’s a Way,” the Chicago Daily Tribunediscusses the impact that the railroads have had upon the city. Leading with a description of the business district, an area circumscribed by Chicago Avenue on the north, Sixteenth Street on the south, Halsted Street on the west, and the lake, the paper states, “Of this 2,140 acres the railroads own approximately 50 per cent, one-half of all downtown Chicago. 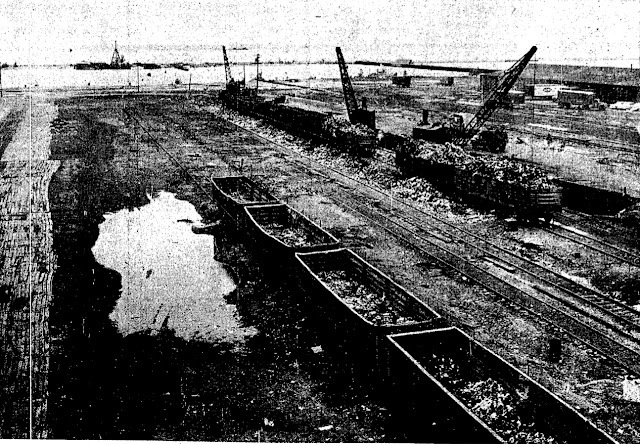 Something like 1,000 acres in the heart of the city are given up to railroad terminals and rights of way.” Taking one portion of that area, the paper veers toward the unimaginable, the development of the huge railroad freight yards south of the river, east of Michigan Avenue, and north of Randolph Street. “By way of violent and impossible supposition,” the article states, “imagine that the eighty acres now occupied by the freight yards and houses could be thrown open to office and business buildings. 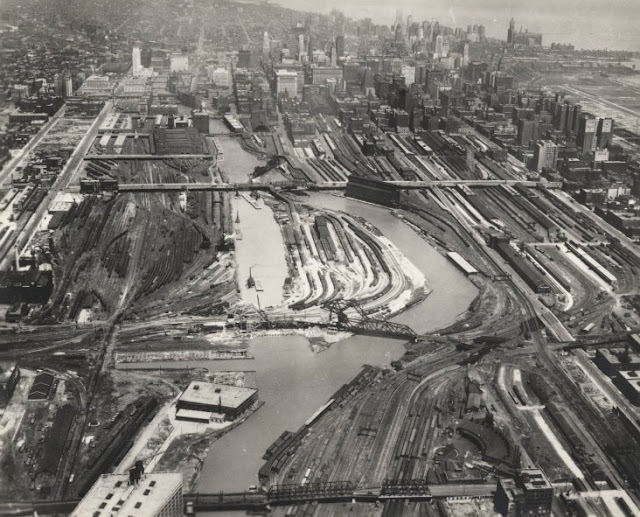 There would be plenty of sites out there on the lake shore which would offer almost unequaled opportunities for fresh air, sunlight, ventilation, and unobstructed views.” Of course, that development eventually did occur – over 60 years later in what is now Illinois Center and Lakeshore East. The article also traces the impact the railroads have had on getting from place to place within the city. Because of the blockade of railroad tracks, the article asserts, there are only four streets left, running form the center of the city to the west side, “on which any sort of retail business can be expected to develop as it overflows from the east side of the river.” It is even worse on the south side of the city … “Running to the south from the business center there are only three streets possible for retail business and one of these, Michigan avenue, is already almost solidly filled with the salesrooms of a single line of trade [the automobile].” The top photo shows the extent to which the rail yards dominated the South Loop in 1929 when the river's course was changed in a massive construction project. The photo below that shows how dramatically things have changed, a change that continues with the development of land east of the river south of Van Buren Street today. May 23, 1959 – With a royal visit from Britain’s Queen Elizabeth coming on July 6, city officials are working feverishly to tidy up the city for Her Majesty. 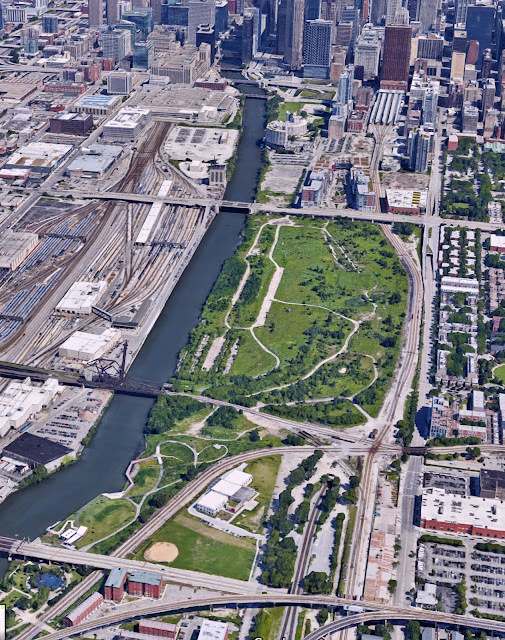 This day brings news that an area one thousand feet south of the Chicago River and just east of Lake Shore Drive which has for more than 30 years been used to load thousands of tons of garbage onto railroad cars will be cleaned up. “When the wind is right,” the Chicago Daily Tribune reports, “odors are wafted over Lake Shore drive and into Grant park, where the queen will enter Chicago” [Chicago Daily Tribune, May 23, 1959] The shut-down of the operation on the lakefront is made possible by the completion of a new incineration plant at One-Hundred Third and Doty Avenue and a new system in which large trailer trucks are used to haul refuse to Lake Calumet. 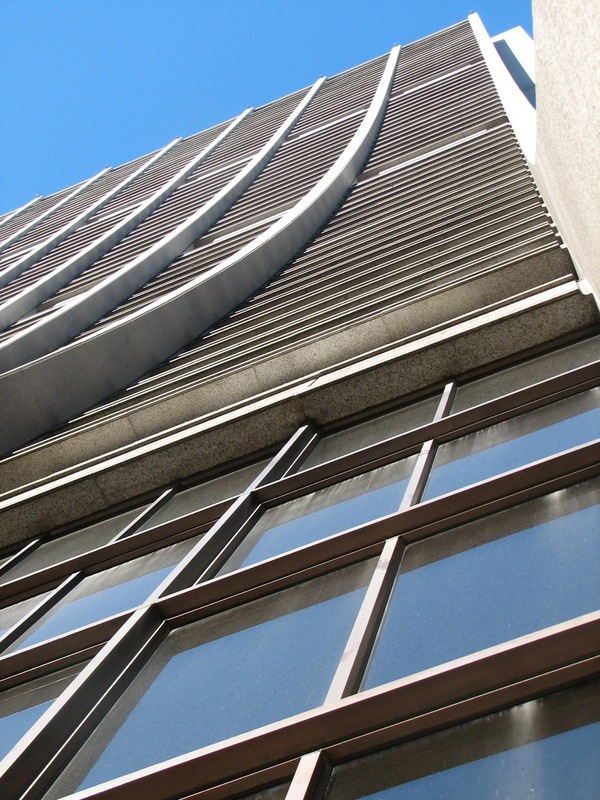 May 23, 1969 – Brink’s armed guards move all of the money and securities in the First National Bank of Chicago through a temporary underground tunnel and into the hands of waiting tellers in the bank’s new building on Monroe Street, between Dearborn and Clark. The whole operation takes less than 30 minutes. At the close of business on this Friday tellers are told to move to their spaces in the new building just to the east, where they find workers still installing bullet proof windows at their counters. The following Monday the new bank will open, and the process of tearing down the old one will begin.